It's because I think too much: Lake Powell, Here I come! 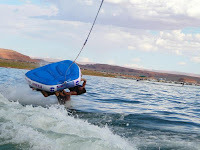 Lake Powell, Here I come! Well, I'm off for a little vacation. 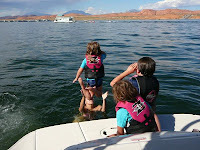 The dad-fam and I are going to Lake Powell for a little wakeboarding, boating, tubing, swimming adventure. I'm a camera whore and I can guarantee there will be at a minimum 4-6 different cameras, not including camera phones, so be prepared for picture not overload. Just kidding, I'll keep it reasonable. If I get downtime, I'll be updating my twitter, so make sure you're following me! Omg, my sister wants to go there sooo bad. That is going to be an awesome vaca! Be sure to tell us all about it!! Oh man! I want to come! !